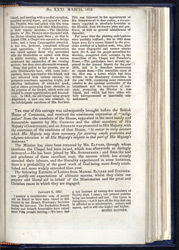 This periodical was produced by the Wesleyan Missionary Society and is the March 1828 edition. The Wesleyan missions to the Caribbean began in 1786 when Thomas Coke was travelling to Nova Scotia but was driven off course and landed in Antigua. Within a few years all the islands in the Caribbean had been visited and missionaries had preached to hundreds of people. The illustration on the front of this periodical depicts a Wesleyan Chapel in Barbados. It was destroyed by riots in 1823 and was replaced by a more impressive and spacious building.